Suit production is winding down, now that just about all the construction and fitting is finished. There’s still a lot of small details to fill in, but at the moment we’re saving those finishing touches for later. This week a big focus was working on the second part of this commission – scratch-build ranger helmets for the pilots of the big ‘ol mecha. As I mentioned in the first build log, our customer’s vision for this armor is that of a mech piloted by multiple rangers/troopers, ala Megazord Power Rangers style. This means that the pilots will need appropriate Sentai-style helmets. Of course, we’re not uninspired enough to just rip a design straight from an already-existing helmet, so my partner went ahead and sketched up a few original designs for our client to look over. Now, we really have zero experience building helmets like these. We’ve built plenty of Gundam-style helms and robot heads before, but Ranger-style helmets are a totally different ball game, if only because they won’t have the kibble and flair that mecha heads have to hide their seams and flaws. These will need to be built exceptionally smooth, and look properly like something a person would wear, rather than the head of a giant robot. All the troopers will be sharing the same helm design, rather than each one being individually unique (which makes it both easier and harder on us – we won’t have to go through R&D for multiple helmets now, but we do have to work extra hard to make sure all the helmets are identical, with minimal deviations). Our secret weapon that we hope will make or break these helms is a new material we’ve never worked with before – a “brushable plastic” epoxy called Epsilon. Apparently it was developed for Disney and is known to be a good sealant/finisher in the foam cosplay community. The advertising for this stuff makes it sound magical – applied via brush, self-leveling/thickening, fills gaps/seams, flexible(?) and sandable. Like traditional epoxy though, it still requires a two-part mixture to make the stuff work. And apparently it needs to be done in fairly precise quantities, necessitating a ton of disposable plates/bottles and a trusty kitchen scale. Brushing it onto a leftover scrap piece as a test, just to see how the material goes on and what it’s like to work with after its cured. Goes on somewhat creamy-milky. In my mind I expected it to be just very runny putty, but not quite – it’s closer to gloss glazes or varnish that I’ve worked with in the past. It now needs several hours to cure until we can sand/paint it. Of course, we’re building the base helmets out of foam the traditional way – and with our new 23″ Ben 3.0, we shouldn’t have sizing issues. One drawback of our new larger head is that it lacks a nose though, and thus it’s very hard to tell where the center of the head is supposed to be when I’m drawing my templates. Solution? Nose transplant from Ben 1.0. I’m taking extra care in building this template, since in theory it should be used for all five helmets that we’ll need to put together. As usual, half of the head is cut out of tinfoil/tape templates, which will then be reversed and cloned to make the other half. There is a “front” and “back” because this time we anticipate the helmets splitting front/rear, rather than just slipping on. Transferred for final paper templates, which will now be transferred onto the foam for the final pieces. Looking…like something. I’ve seen ranger helmets built where the top is a hinge and the sides split open to allow a head to be clamped inside, and that’s the idea here. It fits over Ben 3.0 alright, but the shape is definitely not Sentai. This is going to need work. Before moving forward, I was impatient to test the clamping system in order to see if the helmet was wearable at all. We thought that adding elastic bands inside the split would be a good idea, where it could expand to fit a head inside, and then pull itself back together so it would be flush on the wearer. This idea was quickly shot down. For one, the foam wouldn’t quite hold its shape to clamp properly, since it was still too flexible. It needed to be hardened with the epsilon first before we could actually work with an attachment system. The most glaring issue, however, is that our elastic is actually way too taut – it doesn’t stretch enough, with the above being the maximum amount it can expand. Given this, we’re better off thinking up a new system with velcro or other straps. I’m not sure why he insisted on trying it to fit the thing over his head. I suppose he paid the price for his lack of vision. The epsilon on our scrap piece is now mostly dried, and handling the thing is really a surreal experience – it’s foam, but it’s hard. The thing’s like a football – and it would actually fly because it’s not just a spongy foam thing now. My partner’s started sanding it down to see if we can mitigate some of the brush strokes and dips/bumps. Unfortunately it doesn’t look like it self-levels completely – sanding after application would always be ideal. But sometimes when the epsilon has pooled on the edges because of course it did, sandpaper alone won’t do the job. Dremel work was needed to bring the particularly egregious mountains down. Test-painted with a can of leftover green. I’m having high hopes. Aside from feeling nearly like porcelain for how smooth and glassy the finish is, it also filled in the giant gaps in this piece pretty well – I’ve no doubt that if we went with a few more layers and really coated it up it could have turned the surface into a smooth featureless ball. Effort number two. This time I took the original templates and expanded them somewhat, in order to round out the face a bit more, get rid of the nose bulge, and make it larger without the need for a center strip. This process was extremely disheartening. From the moment my pen landed on the foam to draw the visor and faceplate out, I knew it would look silly as all Hell get out. There weren’t any precise references I could go off of other than a pencil sketch, so it took a lot of redrawing on the foam to get something that looked…still silly. Hurr durr kill me pls. It’s the mouth more than it is the visor. I threw a backplate in there just because I couldn’t stand the gaping onahole look, but I realized that the shape itself needs to be widened to not look dumb. We also determined that the shape of the helmet itself was too tall – the top needs to be brought down and in, since ranger helmets are traditionally deeper than they are long. The prim and proper approach to solving this problem is creating brand new templates and adjusting them until we get one that works, but after going through two fruitless prototypes I determined that we have neither the foam nor the time. Solution? Cut bananas out on the sides of this prototype and force the foam to contact. It took a lot more trial and error than I would’ve liked, but the banana worked – we finally got it to where we can see it as an actual ranger helm. The seams look deeper and messier than the cracks that send you to the underworld, but that’s why this helmet is a prototype – its data will be used to finally move into the production models. Hacked apart so it can be used as a template – the paper and tape templates from earlier are now wasted effort, unfortunately. Even the production unit will require some modifications though, which is unfortunate because I’ll need to make the exact same modifications on all subsequent helms – I’m very unwilling to tear this one apart and use it again as a template. Needed to add a strip to the top of the visor to bring it down and make it look less goofy, then cut a triangle out of the forehead to bring it in because it flared out too much. Final. Now to just do this four more times, the exact same way, except for the ones where I’ll have to expand the templates to accommodate different head sizes. Sent in for its first coat of epsilon – hopefully that magic stuff will be able to fix the crazy ridges, bumps, and splits. While I was agonizing over the helms, my partner was picking up where he left off last time with the shield. Cardboard supports added on the inside of the front shield plate to keep the shape. I don’t think I mentioned it last time, but our shield mandate was basically to make it transformable – into an eagle-esque mech. We were given the original Megazord’s pterodactyl unit as our base for inspiration. Thankfully, that means if we’re basing it off the old toy, it translates to a transformation system that doesn’t necessarily have to be extremely complex. For things that need to swivel and move, our go-to is some PVC pipes. These fittings are attached to a piece of cut pipe that’s attached to the body of the eagle/shield – they’ll be able to swivel up and out, with wings attached, meaning this is our wing open/close system. The only other moving part will be the head, which will be attached to a PVC hinge system in the body, and flip over and out, in a manner very similar to G1 laserbeak. PVC pipes needed to be ground down and re-taped to ensure smooth swiveling during transformation. I was going to suggest using Laserbeak as a guide for creating a transformable eagle/bird mech, but he went ahead and threw this (remarkably similar) head design together before I even had a chance to show him. Sketching out some ideas for the shield face that we could eventually scribe in. I told him to look towards the Hylian Shield for reference this time. And of course, Rangers/Troopers aren’t who they are without tight-fitting brightly-colored spandex suits. We won’t actually be using these suits to craft more armor from though – our client only sent them to us so we could match their colors. The team colors will be red, blue, pink, beige, and gold. Since each trooper will be wearing one of these suits along with their corresponding helmet, we need to make sure the paint on the helmets match these suits, hence why they were sent to us so we could work on color-matching them. The red, blue, and beige were pretty easy – standard colors that were available at WalMart where we usually get our paints. 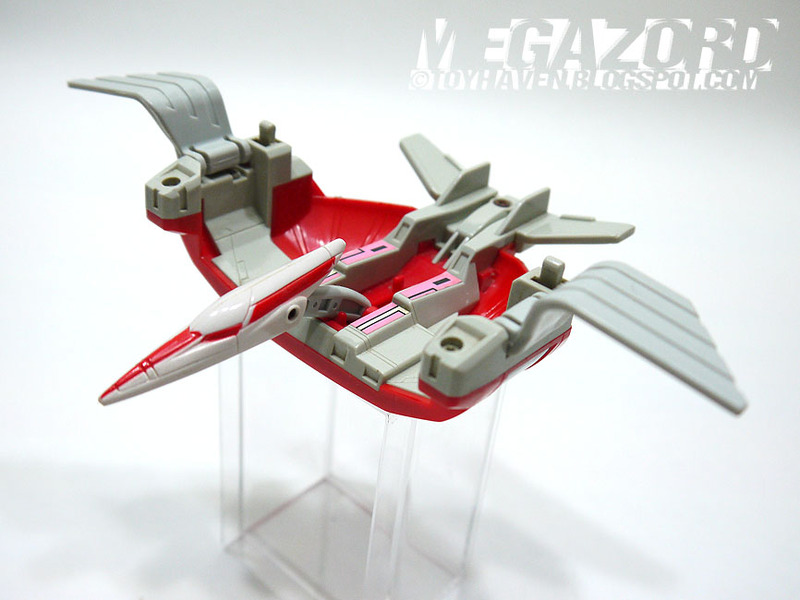 The pink, though – this shade of pink was rather unique, and even Tamiya didn’t carry it in their lineup. It’s a bit of a hot pink, but most hot pinks offered by other companies were too hot. Thankfully, we managed to come across just the right color from a brand we’d never heard of before (valspar?) after a bit of hunting. The gold though – oh man that gold. The fabric material is shiny, shimmery, glittery, and all sorts of out-of-this-world. It’s very apparent that none of the usual gold paints my partner and I use for model kits or other projects will do the job on this one – we’ll either have to mix something up ourselves or find some specialized paint online that will hopefully do the job (we went with the latter option, and are now waiting for it to arrive to see if we hit the jackpot or not). Masking the actual mecha itself for painting in between my helmet-cloning sessions. Masking the mech helmet almost felt like vinyl wrapping – it’s going to hurt so much to take all of it off after the paint’s been laid down. Backpack painted “oil rubbed bronze” – it’s basically gunmetal gray. As usual, large surfaces that need to be masked were covered with clear cling wrap, the stuff used for food. Sword core/pole painted flat black, while the blade is Plasti-Dipped. Really looking forward to seeing some gray break up all the white. Paint on the feet was really acting up and going on weird – we suspect it’s because of the temperature (sub 60 degrees when we paint at night most of the time, which is super not ideal, but usually an extra thin coat during daytime is enough to get it solid and proper). Chest unit has finally been cleaned up from the Bondo job that was applied last time, and is ready for a new coat of Plasti-Dip followed by paint. Sanding down the first production helmet after the epsilon has cured. Primer’d. The epsilon helped with the seams, but they’re very clearly still there, and that won’t do. The madman is actually going in with fiberglass Bondo to fill the seams. It’s going to look fantastic and perfectly smooth, but the amount of fiberglass sanding and sculpting I see my partner going through to get to these results are concerning. Epsilon, sand, Bondo, sand, repeat. Meanwhile I just need to crank more of those shells out. The first production unit (white, on the right) was actually cut down to be smaller in order to have the correct shape. This is okay for that particular helmet because one of the trooper actors has a small head, so that one will fit fine on them, but the rest of them (particularly red trooper) have larger craniums, meaning I can’t afford to cut down on size for the rest that I build. Making any adjustments to the original helmet templates in order to increase size will drastically screw with the fitment of the parts and effect how round the final shape is, because curves do that. Cutting a long triangle out of the area and cementing the two open edges together will bring a flared shape in, if it happens to be funky looking because it’s too large. For the most part this works excellently, but the nature of bringing sections in means I lose helmet size, so I have to be careful when doing these modifications lest the helms all become too small to actually wear. The sword blade is to be silver, so my partner and I went for the first silver we saw on the shelf – Rustoleum’s metallic finish silver, which, if we go by the cap, is actually supposed to be reflective chrome. Both my partner and I have worked with enough silver spray paints to know better than to buy into the hype – it’s not going to come out looking like smooth aluminum foil, but it’s going to be some sort of silver, and that’s what counts. To our surprise though, the paint is actually a lot more reflective and chrome-y than we expected. It certainly gives off a nice shimmer in the sunlight on the big blade. The guard/hilt/pommel are all black, with the circle section of the guard white in order to match the mecha chest (it’ll have the logo in it later). This looks good, but it’s still missing grip tape that we’ll be applying to the handle, and somehow the blade is too silver. Masked the one trim piece on the base of the blade off so we can get some color breakup on there. Looks better. It won’t be finalized and assembled until next week. It’s really starting to take shape with the splashes of color on the white. There are still quite a few more sections left, so we can’t test-fit all the units to see it all come together yet. The last helmet I’m putting together is going to be sized as an XXL – there’s one trooper (red) who has a particularly large noggin, so I have to expand the usual helmet size quite a bit to make sure it’ll actually go around his face. Because I’ve met with some bad times expanding the templates, I went with the good ‘ol fashioned strip-in-the-middle technique. That one strip then caused a whole bunch of fitment and shape issues, necessitating even more modifications up front to make the visor opening look less derpy. Nevertheless, one weekend later, and we have five helmets nearly ready to go. They look a little egregious right now because the visor sizes are all over the place – the one on the far right is the OG, first production unit, so it has a very tucked in aggro look, while the other ones progressively got larger thanks to losses in translation when I kept using each successive helmet as a template for the next. But this is okay, because it’s easy to just cut the more aggressive ones to make them larger and line up with the others. Yet while the base construction on these helms is done, there’s still a long road ahead for my partner to epsilon/bondo all of them to harden them up and get rid of all the surface blemishes.